ATLANTA -- Jimmy Carter no longer needs treatment for the cancer diagnosis he revealed in August, a spokeswoman for the former president said on Sunday. Carter, 91, apparently shared the news at one of his regular Sunday School classes at Maranatha Baptist Church in his hometown of Plains, Georgia. Carter announced in August that he had been diagnosed with melanoma that had spread to his brain and laid out a treatment plan, including a round of targeted radiation at the brain tumors and doses of an immune-boosting drug every three weeks. Keytruda, the drug, was approved not long before Carter's announcement and helps his body seek out and destroy cancer cells. Carter's spokeswoman Deanna Congileo said in an email that Carter received doses of the drug from August through February. She said his doctors will continue to perform scans to ensure cancer cells have not returned, and Carter will "resume treatment if necessary." A spokesman for Emory University's Winship Cancer Institute, where Carter has been treated, declined to comment on Sunday, citing patient privacy. Medical experts have called Keytruda and similar immune therapy drugs "game-changing" for patients with melanoma. But the drugs are relatively new, and doctors are still learning about how they should be used, said Dr. Len Lichtenfeld, deputy chief medical officer for the American Cancer Society. He is not involved in Carter's treatment. "Some people believe they should be continued as long as a patient is doing well, some feel the drugs should continue for a period of time and then be stopped," Lichtenfeld said. "This is clearly a (decision) based on individual evidence specific to the president and made with his doctors." Carter always starts his lessons with a brief update on his recent activities. 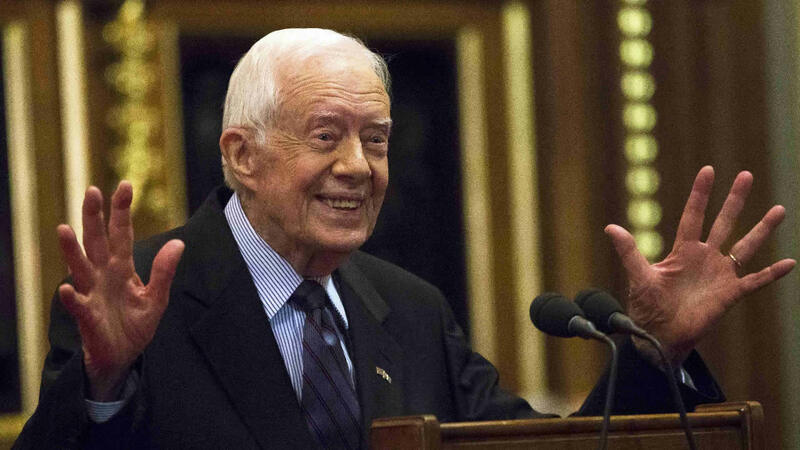 Carter made a similar announcement at a December Sunday School class, when he told the audience that a recent scan of his brain detected no sign of cancer. At the time, Carter told the group that he planned to continue receiving doses of Keytruda every three weeks. Jill Stuckey, a Maranatha Baptist Church member, said in a phone interview that Carter's updates have become "a pattern for our church." "President Carter comes in, tells us phenomenal news and we all applaud," Stuckey, also a close friend of the Carters, said. "We're all on pins and needles wondering how things are going, because you never know from looking at somebody. We're thrilled." Carter has remained active throughout his treatment, including participating in a building project with Habitat for Humanity. He also continued work at the Carter Center, the human rights organization he founded after leaving the White House, setting aside his initial plans to step back during treatment.